Image by Boss Tweed via Flickr It was an incredible display from Roger Federer to see off Andy Murray's hopes of securing his first Grand Slam title. It would have been Great Britains first major title since Fred Perry last won the US Open in 1936. My sister's boyfriend just thought Fred Perry was a designer, he was put straight tonight as was Murray who after emphatically seeing of Nadal in the Semi Final just couldn't handle the legend that is Federer. People have criticised him over the last few months and maybe he is no longer in his prime but making 3/4 finals and securing a gold medal at the Olympics in the doubles it hasn't been that bad! The way I see it is that he just hasn't worked out how to beat Nadal yet but as Murray showed yesterday he is human and can be beaten! Federer won this final, the fifth US Open in his illustrious career in 6-2 7-5 6-2 and although Murray was better in the second Set it seemed inevitable that it was to be Federer's day. He controlled the match, changing the play and using his backhand and powerful forehand. Murray is growing in statue and even though he lost I feel that it is only a matter of time before he achieves on this stage and wins a Grand Slam. “I got the better of him the last two times we played, but he definitely set the record straight today,” Murray said. Federer’s has now won 13 major singles title, and closing on Pete Sampras’s record of 14 men’s singles Slams. With the Slam's over this year, next year is looking great for the Men's game and even more exciting now that we have a player in contention. Just like the Premiership we now have a big foursome in Federer, Nadal, Djokovic and Murray. Should be many more classic matches, another Wimbledon like the last would be good although that will take some beating in terms of the shots that were played. 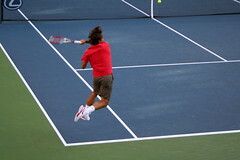 Here's to the 2009 Tennis tour!! Hi I'm Joe, Can I Take Your Name..
Rome was not built in a day!